Your children’s dental health is paramount. 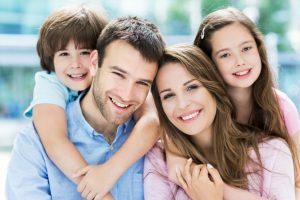 Summer is a great time to schedule their routine exams and cleanings with family dentist, Dr. Yelena Obholz of Aesthetic & Family Dentistry of Washington. From toddlerhood through their teen years and beyond, your kids will receive superior preventive and restorative care in a friendly, happy atmosphere. The American Academy of Pediatric Dentistry maintains that baby teeth are teeth which perform important functions. Healthy baby teeth allow kids to eat and speak properly, and they usher adult teeth into the mouth at the correct time and in the best alignment. Dental decay plagues thousands of children throughout the country, leading to tooth loss, pain and even nutritional and educational difficulties. As such, parents should care for baby teeth with routine brushing and flossing as soon as that first little tooth erupts. By the time they are 3, Dr. Obholz begins routine check-ups, digital x-rays and hygienic cleanings. Depending on her findings, the doctor may recommend plastic sealants to coat deeply grooved young molars and protect them from decay. She often advises mouthguards for children active in sports and for little ones who routinely grind their teeth (bruxism). Also, the Washington, DC children’s dentist and her team teach kids good home hygiene techniques and about the good nutrition. Dr. Obholz takes digital x-rays to find hidden decay, developing orthodontic issues or problems with wisdom teeth in adolescents. As necessary, Dr. Obholz performs restorative treatments such as tooth-colored fillings. She and her staff are always available on an emergency basis for the summer ( and year ‘round) dental problem that crop with with kids–tooth avulsion, lost filling, toothache. Dr. Obholz offers an important dental service in her Washington, DC dental offices. It’s called Toothprints. The dentist uses a Toothprints thermoplastic wafer to record an accurate impression of your child’s bite and DNA–both markers of a kid’s unique identity. This information helps law enforcement find and identify children in cases of child abduction or accident. Taken at ages 3, 7 and 12, Toothprints help keep kids safe. Yes, the kids will be off from school, and the nice weather is here. Why not incorporate a little health and dental care into your fun summer activities? Contact the office team at Aesthetic & Family Dentistry of Washington. Schedule your child’s regular 6-month check-up and cleaning with Dr. Obholz, and enjoy a summer filled with healthy, good-looking smiles.